I've been thinking a lot about a recent performance at Seattle's Velocity Dance Center. "Touch" was part of Velocity's NextFest NW 2013, a showcase for dance cinema and new choreography. In the program, Executive/Artistic Director Tonya Lockyer explains that "Touch" was inspired by Velocity's year-round commitment to "exploring what it means to build meaning collectively." In the context of this performance, that included a curatorial panel that chose young choreographers, allowed them to create, and provided feedback on their work. The program of six new dances provided audiences bursts of youthful energy and glimpses of promise. But, at least for me,it also posed a question. What does it take to bridge the gap between promise and fulfillment when it comes to artistry? There's no doubt that some of these choreographers showed promise. In her live audience introduction, Lockyer singled out choreographer Dylan Ward, creator of the large group piece "Melody Nelson." Lockyer noted that Ward was new to dance, but told us we'd be seeing a lot more of him. So I looked forward to his dance. As a work in progress it was tantalizing, but I think it suffered from the pre-show hype. "Melody Nelson" featured a cast of more than a dozen, peppy music and a lot of running and jumping (the youthful energy I mentioned). There were also a few moments I wish had been more carefully organized, involving hand held lights. It could have been transcendent; instead I was disappointed. I loved the enthusiasm of the crowd and yearned for a little discipline, to wrangle all that energy into a manageable whole. 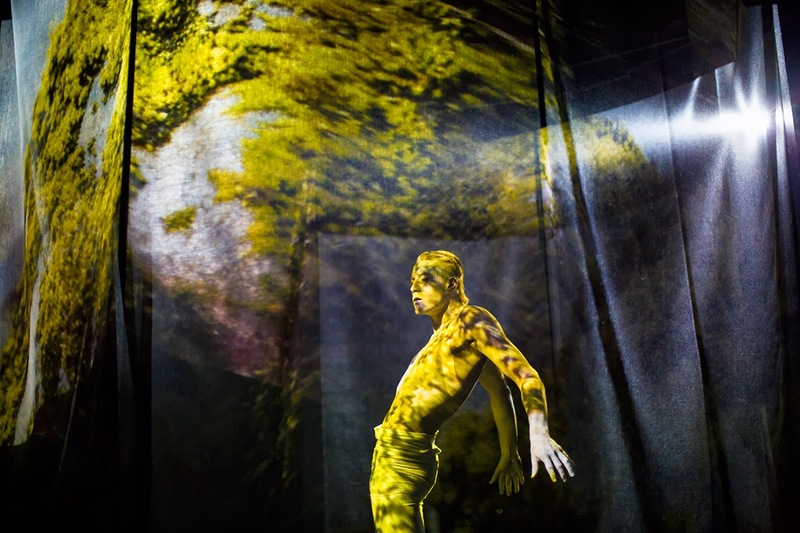 After an intermission, the audience was ushered into a smaller studio to watch Matt Drews, in butoh-white, writhe his way out of a stunningly lit mesh tube. This was one of those dances that titillated with possibility, and started my rumination on the choreographic creative process. Was the Japanese art form Drews' inspiration? What, besides an arresting visual image and the implication of captivity, did Drews want to convey? Does dance have the equivalent of an editor? I'd love to see this piece after a thorough reworking. "Sight", by Alana O Rogers and her dancers (identified only by color in the program), was far more orderly, quite beautiful, and more traditional structurally than anything else on the "Touch" bill. I was particularly taken by Yellow, a tall young woman whose limbs seemed to be controlled by an invisible Gepetto-like puppet master. Of all the evening's dances, "Sight" was the most accessible. 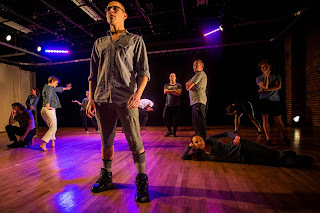 The last work on the program, Coleman Pester's "30 unsure steps to my seat", actually started before the show, when audience members could opt for a blindfolded experience involving one of Pester's dancers. The entire audience was blindfolded before the dance itself, an incredibly relaxing experience after all the energy that had preceded. We could only hear Pester's dancers, as they moved about the large space that was encircled by the blinded audience.When we finally removed our eye shades, we watched the dancers in pairs seem to challenge each other to movement duels. Pester's choreography is brawny and athletic, and in your face. Which is ironic, given that we couldn't see it for half the piece. As relaxed as I was with my blindfold, I wished I could have watched the entire dance. I don't know if these choreographers will go back to rework their dances, or whether they consider what they've made to be complete. According to Velocity spokeswoman Leah Vendl, all six of the artists had several opportunities for pre-performance feedback. Vendl told me via email that providing feedback mechanisms for young artists is part of the Velocity mission. It's something everybody needs: a critical, honest eye and some trustworthy input. How the artist uses that input is another story. A third variable is finding that balance between self expression and communication. As a choreographer, what do you want me as your audience member to take away when I see your dance? We bring the accumulation of our personal lives to the singular experience of a performance. We'll interpret what we see through whatever has shaped us. But if the role of an artist is to be the mirror that reflects our lives back to us, then there has to be some legibility in the final work, some portal that allows the audience more than a glimpse of what the artist has to say.